The Pittsburgh Penguins kicked off the second half to their 2014-2015 regular season with a Tuesday night tilt against the struggling Minnesota Wild. The Wild, coached by former Penguins' assistant Mike Yeo, entered the contest losers of their last five and recipient of a now-infamous verbal rant at the hands of their coach, who left a Minnesota practice early after lambasting the effort he saw from his players. In the teams' previous meeting on November 4th, the Penguins topped the Wild 4-1 behind the strong play of goaltender Thomas Greiss and defenseman Rob Scuderi, who assisted on Pittsburgh's first two goals. Absent from the Black and Gold lineup was Olli Maata, who is now likely to miss the remainder of the season with a shoulder injury that proved unresponsive to treatment. Blake Comeau and Patric Hornqvist continue to miss time for the Penguins as well, with their expected returns still a bit away. In starting tonight's game, Marc-Andre Fleury aimed to secure a victory against the lone NHL franchise he has never defeated: the Minnesota Wild. The Wild mustered the game's first quality scoring chance, with Thomas Vanek shooting a deflected Penguin clear into Fleury's outstretched mitt at point-blank range. Ryan Carter had another primo scoring chance for the Wild, but his backhander from 20 feet out was caught and held by the Pittsburgh netminder. The Penguins struck first when Marcel Goc (finally) scored his first goal as a Pittsburgh Penguin, knocking a careless rebound out of the air and behind Wild goalie Niklas Backstrom. Zach Sill also (again: finally) recorded his first NHL point via an assist on Goc's goal, serving the monkeys on Goc and Sill's back with eviction notices. The Wild managed to push back and very nearly got the equalizer off the stick of Zach Parise, but #29 once again stopped the Wild shooter cold. Turnovers continued to plague the Penguins, as Vanek found himself alone in front of Fleury with the puck on his stick, but the former Sabre failed to convert, keeping the score at 1-0 in favor of Pittsburgh. Shortly after Beau Bennett's tough-angle shot failed to find the back of the net, David Perron went right-to-left on a rebound and deposited a backhander off of the low post to give the Penguins a 2-0 lead. The goal was Perron's second since joining the Penguins, and provided validation for sending the Edmonton Oilers both Rob Klinkhammer and Pittsburgh's 2015 first round draft pick. Late in the first period, Malkin's line put on a Globetrotter act for the crowd in the Consol Center, but despite the fancy passing and stick-handling, Pittsburgh failed to capitalize on an exhausted Minnesota defense. PERIOD ONE HOT TAKE: David Perron is very good professional ice hockey player. PERIOD ONE STAT THAT MAY ONLY INTEREST ME: Wild defenseman Ryan Suter played an absurd 10:41 in the first stanza, and was on the ice for both Penguins goals. The Wild came out determined to close the 2-0 gap and nearly did so, but Fleury challenged Zach Parise and negated an early Wild 2-on-1 with a textbook poke check. 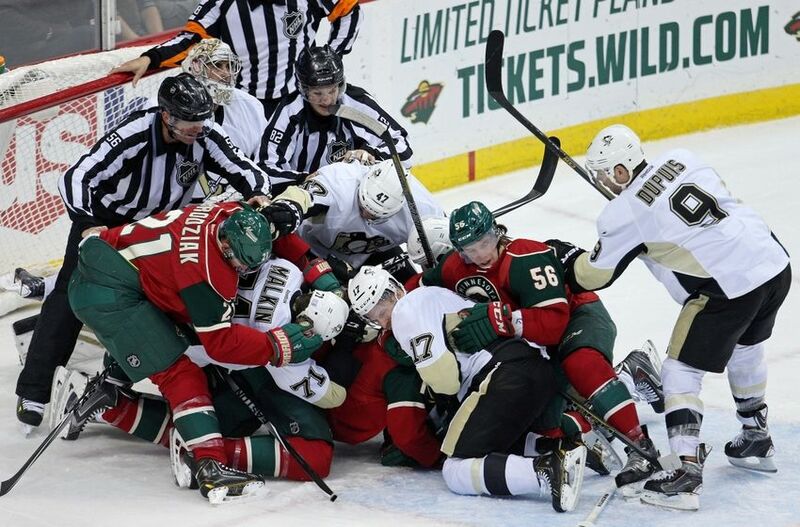 After Fleury fought off a knuckling wrister from the point, the two teams exchanged a series of rushes before Ryan Suter delivered a vicious (and uncalled) elbow into the jaw of Stevie Downie. Almost immediately after Suter's uncalled elbow, the Wild skated down the ice, initiated sustained pressure, and then Nate Prosser found Jonas Brodin moving down the slot. Brodin went top blocker and halved Minnesota's deficit to 2-1. Pittsburgh was awarded the game's first power-play following a Charlie Coyle trip, and the Pens would waste no time, with Chris Kunitz collecting a juicy Malkin rebound for his 13th goal of the season. The Penguins went right back to the power-play after Erik Haula was sent off for boarding Bryan Rust. Pittsburgh's power-play generated two quality scoring chances, but otherwise presented little challenge for the Wild penalty killers. Crosby and Perron generated some late period offense, but Pittsburgh was unable to slip a fourth puck past Backstrom. The second period ended with the Penguins ahead 3-1 but down a man as Robert Bortuzzo took an interference penalty with only 2.7 seconds left. After two periods, Pittsburgh led the Wild in shots 26-23. PERIOD TWO HOT TAKE: NHL officials really don't like Steve Downie, and they let Ryan Suter brutally elbow him in the middle of the ice. PERIOD TWO BONUS HOT TAKE: Jay Caufield continues to look more and more like Mario Lemieux with each passing season. PERIOD TWO STAT THAT MAY ONLY INTEREST ME: Despite his injury time, Chris Kunitz is still on pace to finish tied with his second highest career total in goals (26). The Wild started the third period with a fresh sheet of ice and nearly a full power-play to work with, and the Penguins began with Steve Downie still in the locker room following Ryan Suter's unpenalized elbow. Pittsburgh killed off Bortuzzo's penalty with ease, and just a few minutes later, Brandon Sutter picked up a loose puck courtesy of a Paul Martin block, and roofed an absolutely perfect shot into the upper left corner to give the Penguins a 4-1 lead. Paul Martin would make it 5-1 when he took a loose puck in front of Backstrom and roofed a backhand off the back of the net. Malkin picked up his second assist on the night, moving him within three points of the league lead for points. Minnesota's Mike Yeo may have noticed his career dissipation light going into full gear when Kris Letang activated and sprung past the Wild defense before netting his 9th on the season (from Perron and Crosby). Letang's goal made the score 6-1, but the Wild would answer minutes later when Justin Fontaine found open room in the right circle and buried the puck over Fleury's shoulder. David Perron continued his Penguins' initiation with his second of the game and finished the game's scoring, this time beating former Pittsburgh netminder John Curry with a one-timer off of a pass from Sidney Crosby. Perron's goal gave him 3 points on the night (2 goals, 1 assist), tied with Crosby (3 assists). A slew of Penguins, including Malkin and Kunitz, collected 2 points in the Penguins' 7-2 obliteration of a clearly defeated Wild. Marc-Andre Fleury's win gave him a victory over every franchise in the NHL. POST GAME HOT TAKE: Jakub Voracek's lead for the Art Ross Trophy is tenuous, man. Very, very tenuous.